Actually I have already painted this unit (see Monday, 16 November 2015) but this is for my 'new' French army. The plan is to paint about 8 battalions of French and a similar number of Spanish to entertain the Piedmontese WAS army. 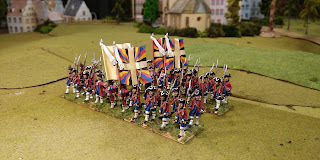 The same French force, which needs to be able to serve in 4 ranks for the earlier period and 3 for the SYW, will then be able to fight the Hessians I am doing and which you have seen recently. These then completes 6 of the 8 planned. The last regiment will be done soon. It should be Swiss too and the Swiss liked to serve together but it will actually be Liégeois. French cavalry of the WAS/SYW is a bit of a problem. There are Front Rank figures but I am exploring another option. 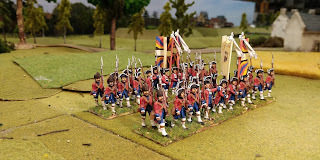 Perry produce some new Spanish Dragoons for the Napoleonic period and I am considering using these with the removal of the bicorne and substitution of a tricorne. There are other problems with doing this (not least the musket, not carbine, is carried on the back) but it might work especially as Perry figures are so nice. The other possibility is to use Eureka Saxons but put them on Front Rank horses (Eureka horses are rather small). You will see results in due course. 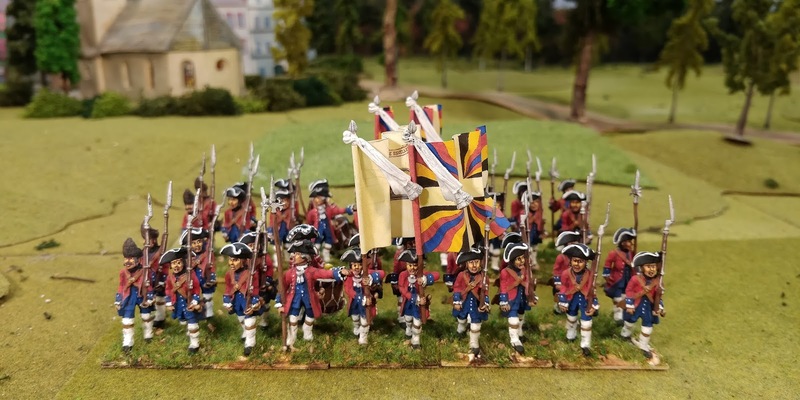 Latest update from Black Hussar: French artillery pieces will be available soon.